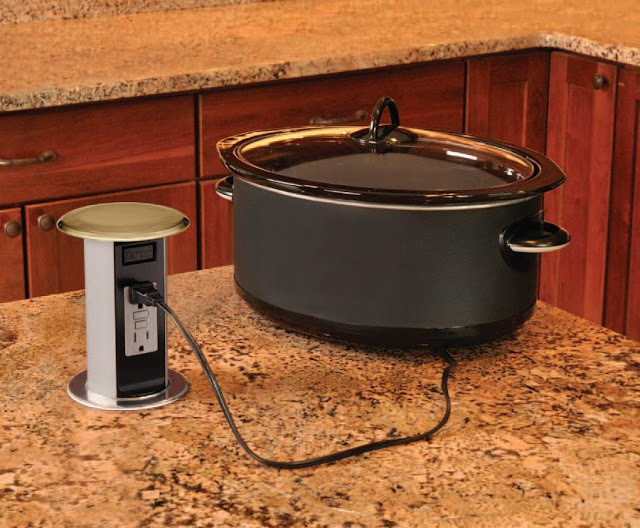 Cupboards Kitchen and Bath: Pop Up Plugs - Counter Receptacles! 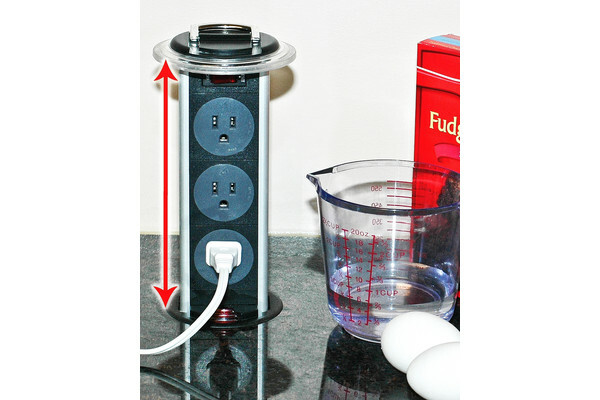 Pop Up Plugs - Counter Receptacles! Back in January, we shared a quick post about the Carlon Pop-Up Receptacle. Interestingly enough, I think it's the most called(like on the telephone) about post we've done simply because there are lots of questions out there about counter top receptacles, their availability and usage. There are currently three that I reference to inquirers. Depending on your situation, timing, budget and whoever plans to install these bad boys, one may have an advantage over the other two. My advice, do your homework and make the best decision for your space and needs. VERY IMPORTANT: Electrical codes vary from municipality to municipality. MAKE SURE YOU CAN USE A PRODUCT BEFORE YOU BUY. Can't stress it enough, but not everyone can have one of these gadgets. The Carlon wins in the looks department- available in nickel, brass and oil-rubbed bronze so it matches your other kitchen metals. Drawback to good looks? Price... The Carlon comes in at tops on the pricing pyramid, by a long shot. I spoke with reps from Thomas and Betts this morning after there were rumblings that the Carlon wouldn't be available any more. It's currently in engineering where they are ironing out some things on the pop-up mechanism but I was assured they'd be back and available in early 2013. Claiming the the first sealed receptacle for use in kitchens, labs, etc. 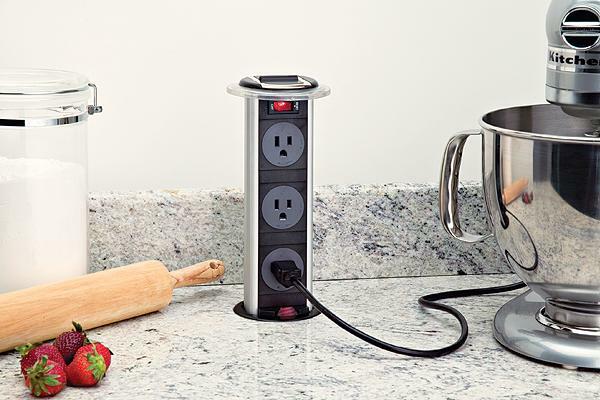 where liquids could be spilled, the Mockett Power Grommet is pull-up receptacle rather than a pop-up one. Simply grab the two metal handles on top and up she goes until you hear the click and it's in place and ready to go. Good use of space, and three plugs are certainly better than two. 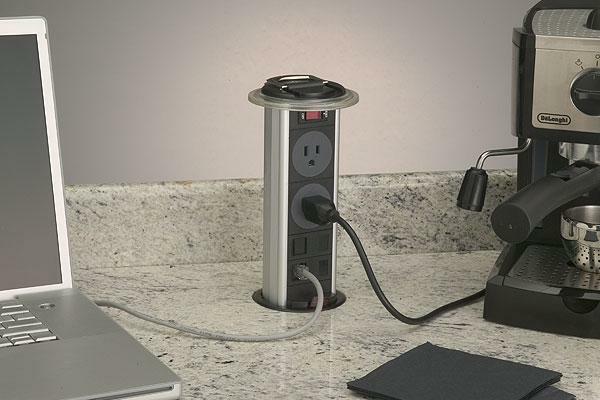 Additionally, there's a Grommet model that allows two receptacles and two data ports... A home-office dream! The Outwater Grommet is the most budget friendly of the three and also features a pull-up mechanism. Available with three receptacles on both the standard(shown) and version with data ports. As I said, check your local code and electrical contractor/supplier before making a decision... Professionals are there to help you! Hope your counters are plugged in! This is very timely. Thanks! I'm familiar with and have used The Mockett product but didn't know about the others. I find these handy to use for those sleek modern islands where you don't want to interrupt a waterfall top with and outlet. Right on board with you, Gloria... Like the look of a waterfall edge, but the outlet would be an eyesore! Once upon a time it was common for your solely power electrical plug sockets you would work with in your house or even within the business office for being white plastic-type switched or even un-switched electrical sockets. It looks like the Carlon pop-up is still being re-engineered.